Did you know handmade alcohol stoves are against BSA policy? Did you know it is against BSA policy for your OA chapter to use handcrafted smudge pots? Did you know that huge closing bonfire at summer camp that springs to life quickly because of the liquid fuel 'starter' is against BSA policy? I suppose the troops that still ignore the policy that paintball is prohibited in Scouting will probably ignore these policies as well. There are some policies in place that may seem silly, but as long as they are there and we're aware of them, we should follow them. Working towards changing those policies is a better course of action than simply ignoring them. "If I know it's not right, it must be wrong." We all know there is an oil spill in the Gulf. We all know it is still not plugged. It's been a month and it's no longer such big news, but more of an ongoing problem. It's sad how we get used to something so quickly. Don't think oil down south will just mean higher priced gas for you. This disaster is affecting you in many other ways. We have three crews schedule to attend Seabase next month. Their trips may be cancelled if the oil isn't contained. If you want to see what's actually happening, just take a look at this Live WebCam of the oil billowing from the break. While you are reading this post, more and more gallons of oil are escaping from underground into the ocean waters. These are ideas for cleaning up the spilled oil. Until the break is stopped, all the clean up in the world won't make a difference. I hope the attempts to stop it work this week - not much more to do but hope right now. But, remember this when it comes time to decide on more stringent prevention requirements in the near future. Next year will be the 22nd World Scout Jamboree and will be held in Rinkaby, Sweden. But, do you know where the 23rd and 24th Jambos will be held? In 2015, the 23rd World Scout Jamboree is scheduled for Kirarahama, Japan. In 2019, the 24th World Scout Jamboree will be held at The Summit in West Virginia - BSA's new high adventure base. This was announced by Tico Perez recently, not just that it was being worked on, but that it would happen. Of course, things can change. Since 2019 is nine years away current Bear, Wolf, and Tiger Cubs are the most probable participants. It's not too early to have a Scoutmaster talk about this global event at one of your year-end Pack meetings and have scouts start saving their nickels and quarters. It's a great far-distant goal that will creep closer while keeping young scouts motivated to progress. A tiger den that makes a pact to attend the World Jambo together nine years from now - wouldn't that be cool? The next time you are at church, or chatting with friends, or right now at work, ask a few people individually what they think of when you say "Boy Scouts". Then ask them how have they interacted with scouts - that is, when have they ever talked to, worked with, or engaged a scout? Go ahead, ask someone a few cubicles over if you're at work. Then, post your results here if you have a minute to share. Tomorrow, our troop has a couple dozen guys cleaning up the outdoors area of the church. We'll work with other folks in the congregation so that will be good. But we really need to toot our horn more - not for the recognition, but so the community knows we're out here doing good things. AND, we need to do more good things, more often. We've got a few community service works we do each year: clean the veteran's cemetary, visit with a senior citizens' home, and clean the church. We also do other service as opportunities arise, as well as a handful of eagle projects each year. Our troop will be lowering the flag at Mt. Rushmore on July 31 this summer. That will be a little bit of exposure, I guess. :-) If you happen to be there, say 'howdy'. One way our troop tries to promote scouting to the community is to have the Troop Historian submit at least two articles to the local newspapers each 6 months. Including pictures really helps, too. Do you have any suggestions/ideas/tricks to get scouting recognized in your community? 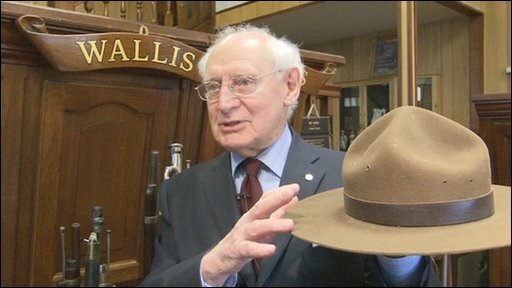 You can purchase Lord Baden-Powell's scout hat tomorrow only. It's being auctioned in England. Something nice to go with that Centennial dollar you bought last month. Another Eagle was recognized last month. I took his fire piston gift along on spring break so I'd get some more whittling done on it. When I got home, it was nowhere to be found. Oh great, it's sitting someplace between here and Switzerland! Well, that saved me a few blisters of extra knife work. You get greedy and hope to find more of it so you keep looking, but there isn't any more. You give up without finding it. I think we reach both those endpoints often. We have a success and instead of being satisfied, we try to get more - whether that's money, recognition, awards, high score, or whatever the treasure is that interests us. That's ok as long as we realize that our last attempt will probably be a failure. Very few people actually "go out on top", stop participating when they are in their top form. Giving up without finding it is more common, I think. Rather than persevering to figure out a great solution, we might do just enough to get something working. Instead of working on that flint-n-steel until finally catching a spark and coaxing the ember to flame, we say that's too much work and not really a needed skill. If the answer, or skill, or reward is not immediately and obviously obtainable, we move on to some other interest. Perseverence isn't in the Scout Law, but it certainly is necessary to be successful.